#breathe. I began filming these daily meditations of the tide a few years ago. My dad had just died, life had imploded on many levels & I was sinking in a more or less permanent state of depression. My morning dog walks with just me, the beach, the sky, the weather, the dog & sometimes music, were my daily dose of serotonin. These moments helped me look up & look out, to breathe, to see & to feel something – usually the crazy weather that made & still makes me laugh as yet again I’m being drenched to the bone & blown about like an empty crisp packet. 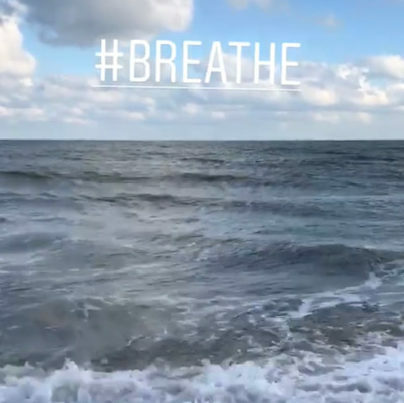 I began thinking that if it was helping me then maybe it would help others to take a little moment to do just this – breathe. To look & not think about anything but the sound, the movement, the light moving & the tide doing its thing. The daily changes of nature but also the thing that happens everyday, all day, regardless of what I’m or you’re feeling or doing. That constant. It became something I film & post in my stories on Instagram (see the link to my feed to the right of the screen) almost everyday & the amount of thanks I get in messages each day from people who feel the same as me & use it as a moment of peace in whatever head space they might be in, always blows me away & I know, for just a moment, I’ve achieved giving people a few seconds of peace, a moment of uplift, a trickle of light in the darkness. .